I have done bingo for lots of the seasons. A cute one for EASTER is HERE at Family Crafts. It is free and printable. Woo Hoo! I love me a freebie! I’m gonna be spending a lot of moolah on my classroom kids for our Easter Egg Hunt this year since I have 30 kiddos! It’s a good time to get those cute plastic eggs too. You can put questions inside them. Then have kids come up, pick an egg, and answer an easter question. Then they can put a marker on the Easter Bingo Board. Class that gets 5 in a row gets a basket of treats. I’d do just a bag of jelly beans or something like that. But I’m a cheapster! lol. 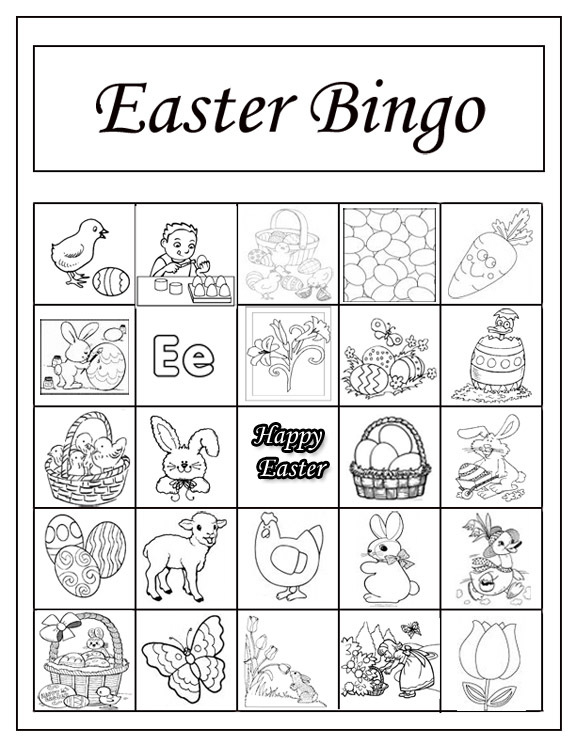 Free Easter Bingo Game that is Printable! For Christmas I do J-E-S-U-S , and for Easter I do BIBLE and for Thanksgiving we do T-H-A-N-K-S. Just make up some clip art pictures of 16 OR 9 OR 25 items that have to do with the season. Then I cover each of the pictures with just colored paper squares or wrapping paper squares. Then put a number on each square that covers each picture. 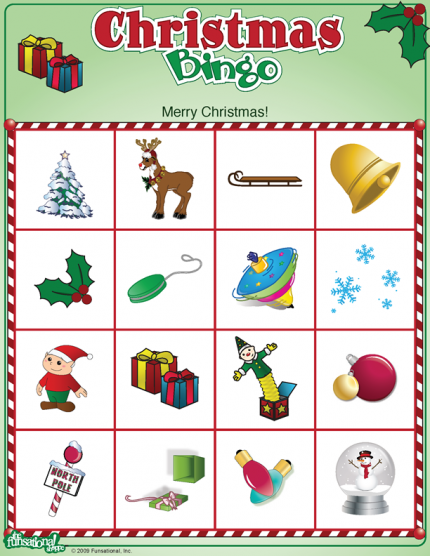 Christmas Bingo Game – Make your own BIG ONE! 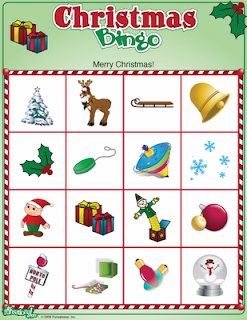 A FREE downloadable bingo card from DTK for Kids is fun and easy to do. The link is HERE. It will give you ideas for every holiday under the sun. And if you have a color printer it will be CUTE TOO! That’s always high on my list. hehe. They have a Bible bingo that might work too. I copied the calling cards printables and the link is HERE. Just peruse their topics, decide if you want pictures or words (vocabulary option) and then PRINT! I use them a lot in my classroom for theme days too. I have pocket charts from my classroom so that is an easy way to put the pictures up. Another is to put a little piece of magnet on them. Our primary chalkboard is magnetized. You can get small circular magnets from Roberts or Michaels for a few dollars. They will last you a long time too and are very convenient for putting posters and stuff up on the board. 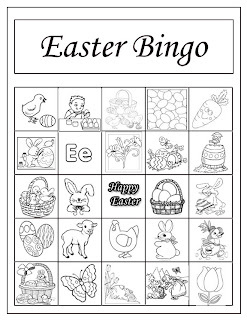 Fun Spring Bingo Games – choose 9, 16 or 25 spots Then we choose a child to come up and I will ask a gospel question or a “finish this line” in one of our new or presentation songs. If they guess the answer a gospel or music question they turn over that number on the bingo board. 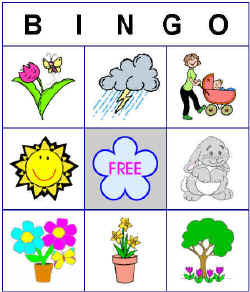 Object is to try to get a whole class bingo 4 or 5 in a row. Or you could make it easier and just do 3 in a row and have 15 pictures or phrases covered up. They have cute holiday and seasons bingo pictures that would be cute to make up for holidays. You ask the questions. Then sing a song. Or pick 2 children and questions then sing a song. You should be able to pick about 8 or 9 kids and hopefully get a bingo even if you have a huge primary. Have fun with it!